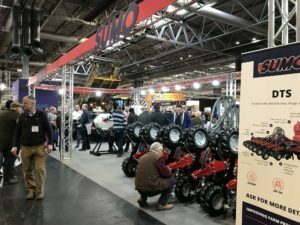 York based farm machinery manufacturer, Sumo UK, welcomed thousands of people to their stand at the highly-acclaimed LAMMA 19 show at Birmingham’s NEC. But, was it really that good? With the outcome of the event very much up in the air to begin with, and some of the bigger players not committing to LAMMA 19, it was a nervous run up to the show for some exhibitors. However, the change in location turned out to be a positive move as the global farming community flooded the all new in-door show in their tens of thousands in support of machinery manufacturers who had invested heavily to attend. 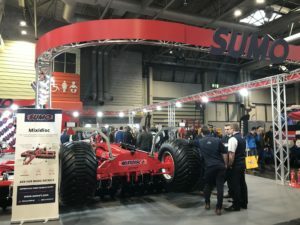 Visitors to the Sumo UK stand were noticeably impressed with the scale and design of the stand which showcased the Sumo DTS 6-meter Deep Tillage Seeder Drill and the new and improved 6-meter Mixidisc S, Sumo’s high-speed stubble cultivator. Sumo’s Mark Curtis, Sales Director, commented: “I wasn’t surprised that everyone enjoyed the new format in-door show. LAMMA organisers have provided a fantastic customer-oriented event that was travel-friendly with zero queues for parking and entry, and an impressive in-door space with almost unlimited access to food and beverage stalls. 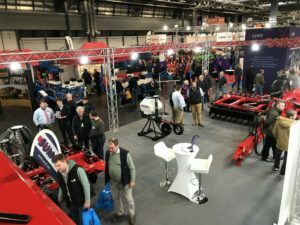 “This was a buyers’ event and customers were happy to linger on the stands and talk in depth about machines, something we never had the pleasure of in the freezing cold out-door shows – LAMMA 19 at the NEC was definitely a change for the better. It turns out that LAMMA 19 really was that good. Sumo have secured their stand for LAMMA 2020 and look forward to building on the success of the event throughout 2019.